At the Society level, ASCE is advocating for Civil Engineers at the Federal level. We are advocating highway bills, education, & licensure requirements to provide the quality of engineer our world needs. At the Section & Branch level (local) ASCE is your personal gateway to Civil Engineering in Texas, Oklahoma and New Mexico. My name is Nancy Cline, and I am honored to be the Region 6 Director. As such, I am the conduit for information and services between the Society and you. 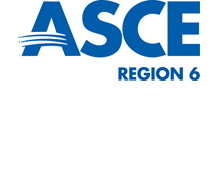 If you have an issue, or need some help with ASCE, I along with your Region 6 Governors, am here to help you.